The GOP nominee's proposal would be twice as bad as Paul Ryan's for people of color and for the country, Imara Jones writes at Colorlines. We all know that Paul Ryan's budget would be a disaster for people of color. 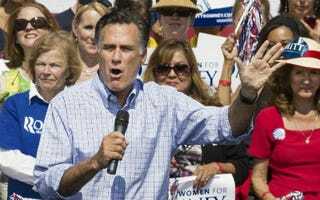 The bad news is that Mitt Romney's plan is even worse, twice as bad in fact. A middle-of-the-road analysis by the non-partisan Center on Budget Policy and Priorities (CBPP) concludes that Governor Romney's budget proposal would require $10 trillion in cuts vs. Ryan's $5 trillion. The unimaginable size and speed of his rollback would fall hardest and fastest on those that can least afford it. Blacks and Latinos—with depression-level unemployment and the lowest level of wealth in these communities on record—would struggle to endure this catastrophic slash and burn scheme. Romney's plan, unleashed during the worst recession in almost a hundred years, would take the present desperate situation to a place that's difficult to imagine. Yesterday's poverty report only underscores the point.